Winix - WAC9500 : Air Purifier Review • The Air Geeks, reviews of air conditioners, dehumidifiers and air purifiers. Are you looking for a highly effective air purifier for your room? The WAC9500 is a strong air cleaner that removes a wide variety of allergens and contaminants from the air before they get into your lungs. This unit is capable of capturing an impressive percentage of airborne contaminants. Furthermore, it captures even the smallest of particles to make sure that your room is clean and free from allergens, bad smell, and other pollutants. Considering that you could be planning to buy this air purifier for your air purification needs, we have gathered information that will help you to make a well informed decision. Whether you want to know its features, merits, or demerits, we have compiled unbiased information that will help you to determine if this is the right air cleaner for you or not. The Air Geeks do not like wasting time, so let’s start with its description! The WAC9500 blends powerful air purification technologies to ensure that your room is free from allergens, odors, and other air pollutants. This unit combines true HEPA filtration with Winix’s PlasmaWave technology to remove various types of airborne contaminants from the air. Have you been struggling to live in the same room with your pets? If you have been having problems with pet dander, smoke, dust, pollen, or any other pollutant, this air purifier may be a good solution for you. Are you looking for an air purifier that is suitable for your large living room or bedroom? According to Winix, the WAC9500 is suitable for rooms that are as large as 284 sq. ft. However, our research reveals that this unit delivers an impressive performance when it is used in a smaller room (around 180 square feet). Its combination of powerful filtration mechanisms allows it to capture up to 99.99% of airborne pollutants. Furthermore, this air purifier is capable of capturing airborne particles that are as small as 0.3 microns. In addition to the True HEPA filtration and Winix’s PlasmaWave Technology, this air purifier features an Advanced Odor Control carbon filter and smart sensor technology. Have you been struggling to eliminate pet and household odors from your room? The Advanced Odor Control carbon filter is highly effective and removes bad smell within a short time. Compared to an ordinary carbon filter, the AOC carbon filter is three times more effective. This unit takes air through a 5-stage cleaning process to deliver clean and fresh air to your room. The PlasmaWave technology neutralizes allergens, odor, chemical vapors, and other pollutants and irritants by breaking them into harmless byproducts. The washable pre-filter of the WAC9500 is suitable for trapping fur, hair, lint, and dust before they reach the HEPA filter. Other impressive features of the WAC9500 include the following: programmable remote control, sleep mode, and four fan speeds. A nice addition : the remote control! Like most household appliances, air purifiers produce sounds that vary in loudness from one model to another. We have observed that the WAC9500 runs quietly and does not produce irritating sound. Unless you are very sensitive to sound, you can place it in your bedroom and sleep comfortably. However, the unit produces a relatively loud sound when it is in turbo mode. The WAC9500 is expected to capture a wide variety of airborne particles as well as bad smell. Nevertheless, we noted that it can produce an irritating chemical smell. It may therefore not be a suitable solution for use in bedrooms, offices, and other places where users are likely to feel uncomfortable. For an appliance that is expected to clean air and ensure that it is free from bad smell, an irritating odor is the last thing that a user can expect to get from it. This is a drawback that the manufacturer should have fixed. Runs quietly except in turbo mode. 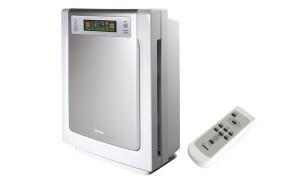 This air purifier does not produce disturbing noise and it can be used in bedrooms, offices, and other quiet places. Combines a variety of air cleaning technologies. This combination enables the unit to capture virtually all contaminants and irritants before they get to your nostrils. Produces a bad smell. Some units produce a chemical smell that disappears with time. Poor odor elimination capacity. We have noted that this unit is not highly effective in removing bad smell. I recently had one of these units die after a little more than 7 months of use. The unit would mysteriously turn off after being on for about 5 minutes. This happened out of nowhere. The unit was operating perfectly fine for the prior 7 months and I have a good deal of experience with these units. I contacted Winix since this unit was under warranty and one that I personally purchased. Their customer support advised me to send an email with all of my information and the unit's information and they would issue an RMA. It took about 3-weeks from the day I contacted them with ground shipping back to them and return ground shipping back to me. The consumer has to pay return shipping charges. Depending on your distance from their facility, this can be a costly endeavor since the item fits inside of a large Uhaul box, if you are missing the original packaging. Winix replaces bad units within warranty with brand new units. The rep. I spoke with had no information on the specific issue I was having other than to say that they sell 1000s of these a day and there is bound to be a bad apple. Just beware that these units DO die (even within warranty) and you will be stuck paying shipping to their facility for a unit within warranty. So far, 1 out of 4 have died on me. Interestingly, the original unit, which this review is based on has been running flawlessly 24-hours a day for 3.5 years now." We have four Winix WAC9500 air cleaners in our home and I couldn't imagine not having them. Initially we got one for the living room to help with the "dog smell" from having two dogs. We liked the way it performed so much that we decided to put one in each of our children's rooms and another in the master bedroom. It has really helped with allergies and does remove that unwanted "dog smell"!" The WAC9500 combines various air cleaning mechanisms to capture a wide variety of airborne pollutants and contaminants. 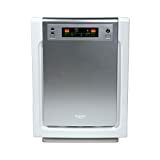 This air purifier is suitable for eliminating dust, pet dander, smoke, bad smell and other airborne irritants. Although this unit offers a combination of filtration mechanism, we have noted that it is poor in reducing bad smell. We have also observed that some units produce an irritating smell. Some users have also expressed discomfort with the hydroxyl radicals that the Plasmawave releases to the air. If none of these drawbacks is a big problem to you, then you can proceed and buy this unit for your air purification needs.